A good wall mount surge protector with a USB is an ideal way to save on floor space and keep your working area neat and tidy. Surge protectors with USB give you an alternative of safely charging your USB enabled devices like smartphones and tablets. It is important for every household to own such protectors to prevent any destruction of appliances that might be caused by power spikes. Below is a list of the best wall mount surge protectors with USB varying from the number of outlets, the surge rating and also the design. 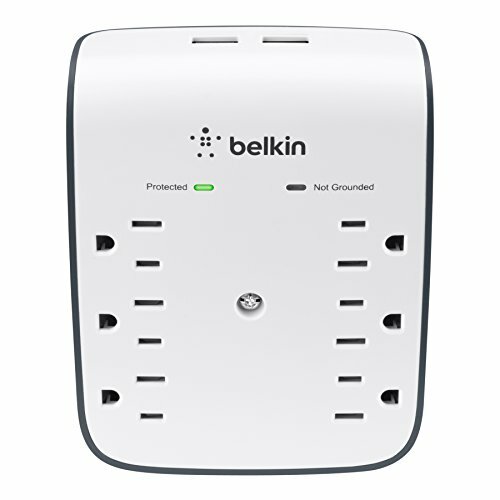 Belkin is a common and popular brand in making quality surge protectors. This Belkin wall-mount surge protector is no exception. With a surge rating of 540 Joules, it guarantees maximum protection to all connected devices and appliances. It is designed with three AC outlets and two USB ports enabling it to power up to five devices at the same time. Furthermore, the two USB ports deliver a combined power of 2.4 Amps for fast and efficient charging to connected devices. This model is easy to use and install. It comes with a screw to secure the surge protector to any wall. It can also fit in any standard AC outlet. 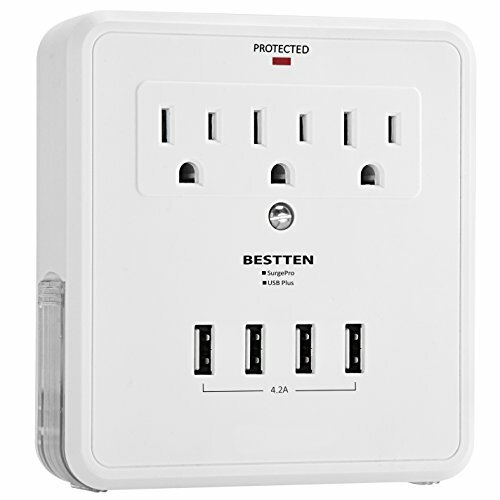 The BESTTEN surge protector provides a safe, secure and convenient way to power your appliances. With a surge rating of 300 Joules, safety wouldn’t be a concern once you connect your devices. It is designed to charge up to seven devices simultaneously. 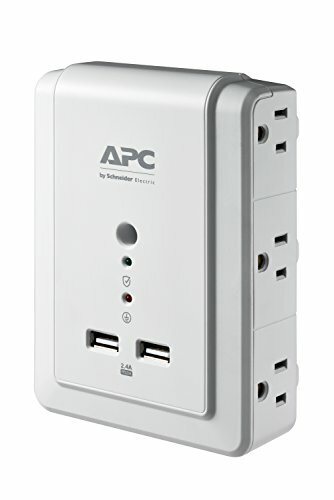 This is made possible by its three AC outlets and four USB ports. Additionally, it is equipped with dual slide-out holders that hold your mobile phones while charging. This keeps the floor space clear of any clutter and messy cables. With an impressive 1080 Joule surge rating, you are sure of getting the utmost protection. The APC is made to charge eight devices simultaneously. It has three AC outlets on both sides of the gadget and two USB ports at the front making it convenient to plug in many gadgets. In addition, the two USB ports provide 2.4 Amps which enables it to deliver the required power needed for fast and efficient charging. It also comes with a light indicator that shows the status of your devices once connected. 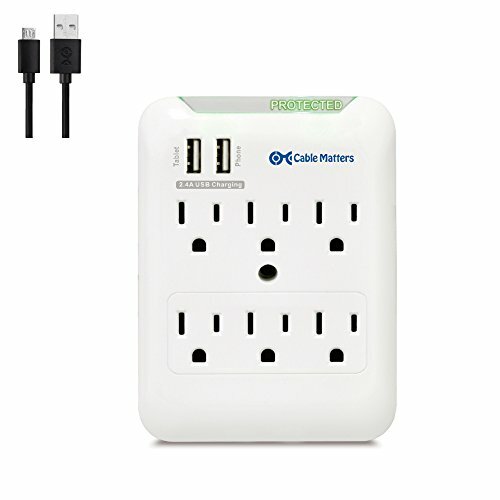 The Cable Matters wall-mount surge protector is another highly acclaimed surge protector which provides the required safety once connected. It has a reliable surge protection rating of 540 Joules that guarantees full protection against any power spikes and surges. It also comes with a green “PROTECTED” LED strip that verifies surge protection status at a glance. This unit has six grounded AC outlets and two USB ports that provide a total power of 2.4 Amps for fast charging. The integrated stabilizing post and mounting screw make it simple and secure to install on any vertical grounded AC outlet. The ECHOGEAR is popularly known for producing top-rated gadgets and accessories on Amazon and the ECHOGEAR wall mount follows suit. Its super sleek design enables it to be mounted in tight spaces and still provide a finished look. With a 540-Joule surge rating, it provides protection from any power irregularities. It is also made of built-in fireproof technology enabling it to control surges without starting a fire. 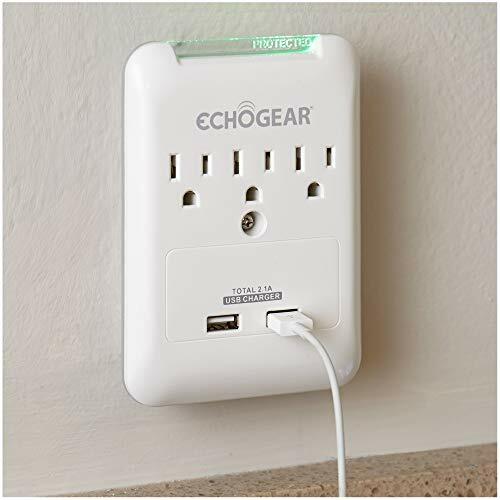 The ECHOGEAR wall-mount surge protector has three AC outlets and two USB ports to enable you to charge up to five devices simultaneously. Mounting the unit is also made easy. It comes with screw anchors to hold the surge protector in place once mounted on an AC outlet. Another good option to consider when getting a wall mount surge protector. Regardless of its small size, it can power up to four devices at the same time. This includes a combined 2.1 Amps from the two USB ports for fast charging to your smartphones and tablets. Its small and compact size also makes it easily portable. Furthermore, it saves on wall and floor space. 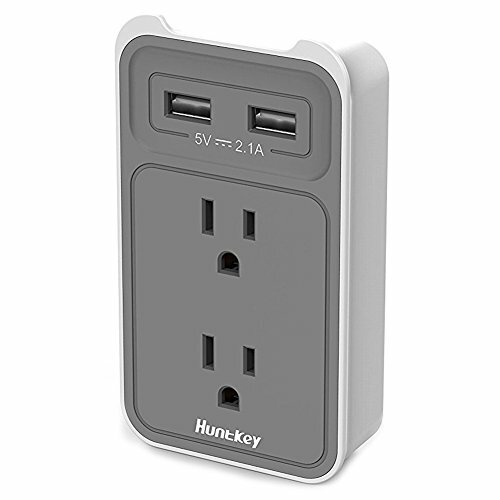 The Huntkey wall-mount surge protector is designed for easy installation. You simply need to plug the gadget into an AC outlet and it’s good to go. 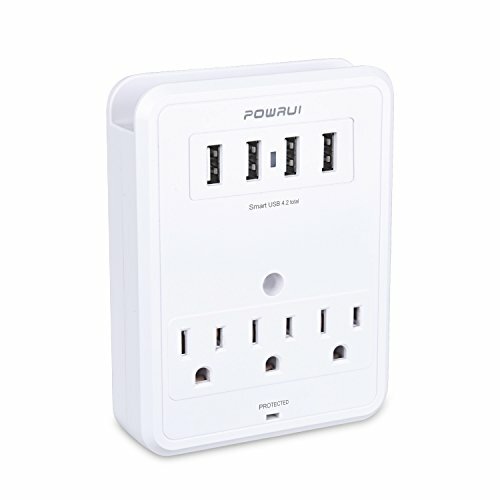 The POWRUI wall-mount surge protector is a superb way to end this list of the best wall mount surge protectors with USB. It has an impressive surge rating of 1680-Joules. This assures a high level of security to all powered in devices. It has a multifunctional design that enables you to power three AC powered devices and four USB devices concurrently. It is also easy to install and use. Once it is plugged into an AC outlet and secured with a mounting screw, it is ready for use.